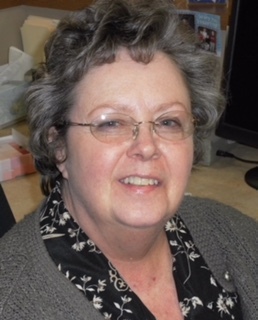 Catherine Marie Proffitt passed away on March 20, 2019 at Lutheran Hospital in Fort Wayne. Her family was at her side. She was born on July 13, 1949 to John E. and Mary Ellen (Titus) Kerr. She married Dennis Proffitt on May 22, 1982. Since 2007, Cathy worked as a cashier at Kroger's Grocery Store. She lived all her life in Wabash. Cathy enjoyed cross-stitch, which she gave many of her cross-stitch products to her family. Cathy was known by many people. She was always described as, "one of the nicest persons, I ever met." She was admired for her compassion for her family and friends. Her greatest treasure was her granddaughters, Ellie and Avery Proffitt. She was so proud of her son, John and his family. Cathy is survived by Dennis Proffitt; son, John (Kari) Proffitt; her granddaughters; her sister, Corinne (Jim) Wesco; her niece, Angie (Anthony) Discordia; three great nieces and one great nephew, and two great-great nieces; all of whom live in Wabash. She was preceded in death by her parents. There will be no services per Cathy's request. A memorial service will be held at a later date. Local arrangements are entrusted to McDonald Funeral Home, 231 Falls Avenue, Wabash, IN 46992.